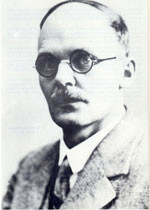 Hans Geiger studied mathematics and physics at FAU. After completing his doctoral degree in Erlangen in 1906, he began his research on radioactivity and atomic physics in Manchester under the supervision of Ernest Rutherford, but later returned to Germany to pursue further research. His outstanding research earned him international fame and brought him numerous awards. His most famous invention is the Geiger-Müller tube, known as the Geiger counter, which is used to measure radioactivity and energy. Image: Gerhard Hesse: Hans Geiger zum Gedächtnis. Georg-Simon-Ohm-Verein e.V. Erlangen 1982.